Savor sunny summer days at Devils Postpile and Rainbow Falls. 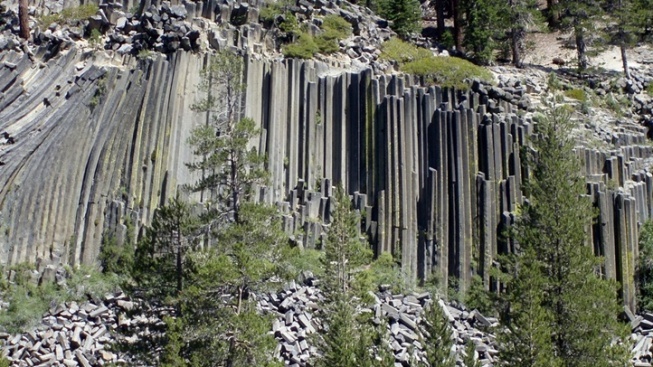 Be dazzled by Devils Postpile National Monument and a host of other area wonders, beginning on Friday, June 15 when Reds Meadow Road reopens. THE SNOW CAN PILE HIGH... along Reds Meadow Road in the heart of winter, and though the drifts can handily keep vehicles out, it can't stop people from daydreaming. They're dreaming about sunshine and summer days spent hiking up to Devils Postpile National Monument, and visits to stunning Rainbow Falls, and beautiful picnics around Reds Meadow Valley. It's a slice of verdant, postcard-perfect beauty, with little bugs buzzing, the occasional small scampering forest critter, and all of the water- and rock- and tree-based beauty a fan of unhampered-with flora and fauna can desire. But our desires run way past our daydreams about this gorgeous, Mammoth-close area; we want Reds Meadow Road to reopen, following the snow removal and necessary repairs, so we can access all of those spirit-lifting wonders. AND THE DAY HAS ARRIVED, or nearly, for Friday, June 15 has been named the reopening date for the winding, beauty-laden, down-to-Devils-Postpile road. Note the later-in-the-afternoon time of 5 p.m., so best plan your first trip down Reds Meadow Road for Father's Day Weekend. June 16 is the start date for the Reds Meadow Shuttle Bus, and "(o)nly exception vehicles will be allowed to drive into Reds Meadow Valley." As for campground openings? Look to June 22 for Reds Meadow, Upper Soda Springs, and a few other stay-the-night spots to debut for the season. Get all of the info you need for one of California's most remote and spectacular slices of wilderness, a region that remains deliciously tucked away during our snowiest stretch of the year. But, come summer? And, in 2018, on June 15? This pretty, critter-romping, granite-wonder-laden landscape says hello again to all who would visit.